Want to know who’s on your front porch when you’re out of the house or snatching packages even while you’re at home? Whether you live in a high-traffic neighborhood or a remote location, it’s important to keep your home safe from intruders. Thanks to today’s technology doorbells are smarter than ever and give you peace of mind for you and your home. Here are our up-to-date doorbell cameras reviews to help you choose the most current and best doorbell cameras on the market. Why Get A Smart Doorbell? The most common point of entry for residential burglars is a home’s front door. Yes, that’s right — an estimated 34% of home break-ins occur in the most visible part of your home! A doorbell security camera is an excellent starting point to keep an eye on your home and to add another layer of protection against home intruders. Most of the first generation doorbell cameras are already behind the times technologically after just a few years. We’ve reviewed the best doorbells on the market and ranked them based on several factors, including more advanced technology, reliability, features and more. Ring leads the WiFi doorbell camera industry in sales and customer satisfaction. They currently offer four models, the Ring Video Doorbell, Ring Video Doorbell 2, Pro and Elite. All models are among the best on the market. With each, you get good video quality, advanced motion detection and the ability to monitor via your smartphone or desktop. With Ring, you’ll get the confidence of having quality and reliability that many other doorbell cameras don’t deliver. We also appreciate that their doorbell integrates with other security systems including their own. Specifically, the Ring Pro gets our vote as the best video doorbell on the market. Recording plans are optional and allow you to review, save and share your videos at any time. Below are the plans available and features include: 60 days cloud storage, share videos with others, save events and more. If you choose to go with no plan, you’ll get instant alerts, be able to stream video and audio, have a live view and lifetime theft protection. CBS This Morning did an excellent piece on the Ring Video Doorbell. See how Ring works to help deter would-be intruders. The SkyBell HD (the newest model) is a feature-rich wireless video doorbell with motion sensors, color night vision and on-demand video streaming that works with your smartphone. SkyBell offers an impressive list of third-party integrations including IFTTT and Amazon’s Alexa . You can even sync the SkyBell with the Nestcam and Nest Protect smoke and carbon monoxide detector. If the circular shape doesn’t work with your current door frame, they offer a Slimline version that is more like the Ring and other smart doorbells (but comes at a slightly higher price). Why isn’t SkyBell our top pick? Several reviewers on Amazon had complaints about the system not being reliable, particularly the motion sensor. But there are also a lot of thoroughly satisfied customers. Full-color infrared night vision up to 15 ft. Known for their smart lock technology, August also has a product that acts as a video doorbell. As a first generation doorbell, the August Doorbell Cam is a little outdated in terms of looks, but still has a lot going for it. Like our top picks, you can get alerts and view video via your smartphone. The August Cam also gives you on-demand video viewing and integration options with its August SmartLock (front door lock), the Nest Cam, IFTTT and Amazon Alexa. What’s missing? You don’t get infrared night vision or lifetime protection from theft of your doorbell. They do have motion detection and video recording capabilities similar to the other cameras. We’re also keeping an eye out for their 2nd gen model, which should be a major contender for our top picks. The following doorbell cameras didn’t make our top three, but you may want to consider them as well. 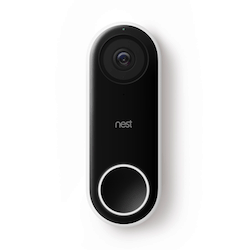 Nest, which offers the popular smart home thermostat and smoke detector, is at it again with their latest smart doorbell camera, Hello. Those who are already loyal to the Nest family of products will appreciate this smart camera which integrates with their existing systems. Plus, it has all the bells and whistles you’ve come to expect with a smart doorbell camera as well as some unique features like face recognition and prerecorded messages. However, Nest has some catching up to do in the smart doorbell category as many complain about the long lag time between when the doorbell rings and when you’re actually notified in addition to the camera not working below certain temperatures. Also, some people complain about it being unreliable if the wireless connection is weak. RemoBell has some great features, but what really holds it back is that some of the features just don’t perform as well as our top three doorbell cameras. For example, customers complain about false motion detection alarms and not being able to hear the doorbell inside the house. Since the doorbell runs on batteries, these false alarms can wear the batteries down sooner, and some users have complained about the doorbell alerting them when cars drive by, which contributes to the false alarms. We’d like to see RemoBell come out with an updated version addressing these issues. Zmodo is another wireless doorbell camera that you use with an app on your smartphone. It has some impressive features including motion detection, on-demand video viewing, night vision and more. The Zmodo Greet automatically records 30 seconds of video when it detects motion and sends the clip to your smartphone. Although, at time of publishing, more than a third of Amazon customer reviews rate Zmodo with only one or two stars. The most common complaints involve unreliability, poor video quality and faulty motion detection. The features are solid, but the product’s execution needs improvement. Your front door isn’t the only area of your home that needs monitoring. Consider a home security system that you can monitor yourself. One of the best ways to monitor your home is through security cameras, such as WiFi models for inside or outside camera systems. Security cameras can help you monitor multiple areas of your home and give you peace of mind. Which doorbell camera is most intriguing for your home security needs? I live in a condo with a well light hallway so the night vision isn’t that big of a deal to have so I went with the August. Also August is smaller and sleeker than the other doorbells which makes it less bulky when you have already existing silver hardware indoors. I love that it integrates with Nest because I have a nest thermostat and protect too.